The research presented by Robert Powell in this book shows that a new science of the stars is possible, based on a study of reincarnation and karma. Willi Sucher did much to pioneer the development of a new star wisdom, or astrosophy, as a scientific tool for the investigation of karma. Powell has discovered that applying the science of astrosophy to the findings of karma research reveals-through the discovery of astrological reincarnation rules-the foundations underlying star wisdom. Once these foundational findings relating to astrological reincarnation research have been assimilated, a reformation of traditional astrology will inevitably take place. Once the new astrology is established, there will be a similar feeling in looking back upon traditional Western astrology that modern astronomers have when looking back upon the old geocentric astronomy. The purpose of this book is to contemplate the incarnations of the prophet Elijah, with the goal of laying the foundation for a new "science of the stars" as the "science of karma." At the close of his last lecture, after discussing the sequence of incarnations of Elijah-John the Baptist-Raphael-Novalis, Rudolf Steiner spoke of this individuality as "a radiant and splendid forerunner...with whom you are to prepare the work that shall be accomplished at the end of the [twentieth] century, and will lead humankind past the great crisis in which it is involved." These words indicate that, from the end of the twentieth century and into the twenty-first century (that is, now), the Elijah-John individuality is to be a "radiant forerunner" for humanity in the next step underlying our spiritual evolution. 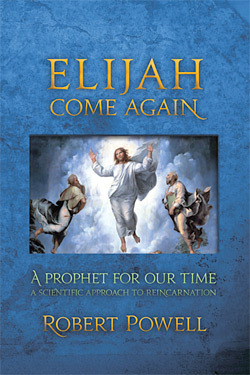 Elijah Come Again presents a scientific approach toward unveiling the mystery of human destiny. This theme is timeless in nature-yet timely, nevertheless, in the recounting of the unfolding destiny and mission of the Old Testament prophet Elijah. This individuality, whose various incarnations are explored in this book, is of such spiritual weight and stature as to call forth both rain and fire from heaven in the service of humanity's evolution toward communion with the spiritual forces of love and morality that live in the human heart as the abiding presence of the living Word. "Elijah does come first to restore all things" (Mark 9:12). These words of Christ apply now-in relation to the ongoing fulfillment of Elijah's mission in the world at the present time toward the peoples of the Earth. Section A: individual horoscopes - for events or for the conception, birth, and death of individuals. Section B: comparison horoscopes - various comparison horoscopes, most of them relating to comparisons between the various incarnations of Elijah. 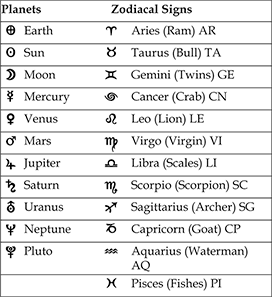 The same principle of ordering the horoscopes is used in Section A and in Section B. It is the principle of ordering the horoscopes chronologically. In Section A the chronological ordering is straightforward. Each comparison horoscope comprises an inner circle and an outer circle, whereby the inner circle is the later horoscope, chronologically, and the outer circle is the earlier one. The chronological ordering of the comparison charts is organized in relation to the inner circle (indicating the later horoscope). Therefore the very last comparison horoscope in Section B is that between Rudolf Steiner (inner) and Thomas Aquinas (outer), since Rudolf Steiner, chronologically, follows Novalis. It should be noted that - with one exception - all zodiacal longitudes indicated in the text and presented in the following horoscopes are in terms of the sidereal zodiac, which has to be distinguished from the tropical zodiac in widespread use in contemporary astrology in the West. The one exception is the tropical chart comparison of the birth of Raphael with the birth of John the Baptist. The Greek astronomer Claudius Ptolemy introduced the tropical zodiac into astrology in the middle of the second century AD. Prior to this the sidereal zodiac was in use. Such was the influence of Ptolemy upon the western astrological tradition that the tropical zodiac became substituted for the sidereal zodiac used by the Babylonians, Egyptians, and early Greek astrologers. Yet Ptolemy did not influence the astrological tradition in India, and so the sidereal zodiac is still used to this day by Hindu astrologers. The sidereal zodiac originated with the Babylonians in the sixth/fifth centuries BC and was defined by them in relation to certain bright stars. For example, Aldebaran ("the Bull's eye") is located in the middle of the sidereal sign/constellation of the Bull at 15º Taurus, and Antares ("the Scorpion's heart) is in the middle of the sidereal sign/ constellation of the Scorpion at 15º Scorpio. The sidereal signs, each thirty degrees long, coincide closely with the twelve astronomical zodiacal constellations of the same name. Whereas the signs of the tropical zodiac, since they are defined in relation to the vernal point, now have little or no relationship to the corresponding zodiacal constellations. This is because the vernal point, the zodiacal location of the Sun on March 21, shifts slowly backwards through the sidereal zodiac at a rate of one degree in seventy-two years ("the precession of the equinoxes"). When Ptolemy introduced the tropical zodiac into astrology, there was an almost exact coincidence between the tropical and the sidereal zodiac, as the vernal point, which is defined to be 0º Aries in the tropical zodiac, was a 1º Aries in the sidereal zodiac in the middle of the second century AD. Thus, there was only one degree difference between the two zodiacs. So, it made hardly any difference to Ptolemy or his contemporaries to use the tropical zodiac instead of the sidereal zodiac. But now - the vernal point, on account of precession, having shifted back from 1º Aries to 5º Pisces - there is a 25 degree difference and so there is virtually no correspondence between the two. Click here to see the current dates of the Sun's passage through the sidereal signs of the zodiac. Without going into further detail concerning the complex issue of the zodiac, as I have shown in my Hermetic Astrology trilogy, I remind the reader that it was the sidereal (according to the stars) zodiac that was used by the three Magi, who were the last representatives of the true star wisdom in antiquity. A full and comprehensive study of the history of the zodiac, how it came to be defined in the first place, is the subject of my doctoral research, published in the book, History of the Zodiac. Each chart indicates the positions in the sidereal zodiac of the Sun, Moon, Moon's nodes and planets and also the Ascendant, the Midheaven, and the other astrological house cusps. The information relating to the Ascendant, the Midheaven, and the other astrological house cusps is relevant only in cases where the time is known, and can therefore be ignored if the substitute (average) time of midday is used. (Note that Christ's ascension really did take place at midday, and so the time of noon used in this horoscope is the actual time of this event and not a substitute, average time.) The data is based on accurate computer calculations of the planetary positions, geocentric and heliocentric, at the time of the event or at the epoch/conception (Ø), birth ( ) and death ( ) of the person under consideration, and this order is adhered to in the ordering of the comparison horoscopes in Section B below. The planetary positions are accurate if the time is known (this statement has to be qualified in terms of the degree of accuracy with which the time is known) and are only approximate if the substitute (average) time of noon is used. The approximate planetary positions are acceptable in all cases, with the exception of the Moon and heliocentric/hermetic Mercury, since the Moon's position can be up to 7½° different if the event took place around midnight, and it can be up to 3°10' different in the case of h-Mercury - both values exceeding the usual three degree range of tolerance for planetary alignments. All planetary positions are listed in the sidereal zodiac to degree and minute; all dates are given in terms of the Julian or the Gregorian calendar according to which was in use at the time, and all times are given in the 24-hour system either as local standard time or as zone standard time. (See below: bibliography of works by Robert Powell for information concerning the astronomical basis of these charts). With grateful acknowledgment to Peter Treadgold for his Astrofire program (see details below), with which the charts and comparison charts for this body of research were produced. For anyone interested in working with or carrying out research in the field of astrosophy or hermetic astrology, this program is ideal, enabling one to produce charts such as the horoscopes below or such as those of Willi Sucher and others. Astrofire has a comprehensive research module for data storage and comparison charts, a star catalog with over 4000 stars, and a database of birth and death charts of historical personalities. It is capable of printing out geocentric and heliocentric/hermetic sidereal charts and ephemerides throughout history. work with planetary aspects with orbs of your choice. Included are eight house systems and a variety of chart formats. It also includes an ephemeris program with a search facility. Astrofire runs under Microsoft Windows. 3143 Avalon Court, Palo Alto, CA 94306, USA. Tel/Fax: 650-494-9900. (Gt. Barrington, MA: SteinerBooks, 1996). St. Elisabeth of Hungary = St. Elisabeth of Thüringia. Hermetic charts are those in which the planetary positions are given heliocentrically and the positions of the Sun, Moon, Moon's Nodes, Ascendant and all house cusps are given geocentrically. This is the astronomical system discovered in 1583 by the Danish astronomer Tycho Brahe (1546-1601). On this account, the Astrofire program refers to hermetic charts as Tychonic charts. With the comparison horoscopes, of the many alignments between the two charts, one particularly striking one is referred to in each case, bearing in mind that it is the occurrence of such alignments in the sidereal zodiac that is the decisive finding of the research outlined in the book Elijah Come Again. The selection of horoscopes in Section A and of comparison horoscopes in Section B encompasses all the references to horoscopes/charts made in the book Elijah Come Again. Some of these charts are included in the book. However, others are not, and therefore all of the charts referred to in the book are gathered together here in order to provide an overview of the material underlying the scientific research into the astrological "laws" of reincarnation presented in the book.